A desirable mattress is a large purchase. But either the comfort of resting or health depends on its quality. The right choice of a mattress may help to treat insomnia, muscles and spine pain, allergic diseases. Having comfortable and healthy sleeping you might get better the permanent tiredness and irritability. Before going to the shop you should know how to choose a mattress. It is not so easy as it seems. You should take into account not only the bed size and your personal preferences but also a lot of other factors. You’ll be offered dozens of mattresses for any taste or budget in any furniture store. How to choose a mattress so that it could help you have a rest for years? The quality of mattress greatly depends on its filling. Most frequently the springs are hidden under the mattress fabric, but box springs can be of different types. Some models don’t contain a box spring at all, providing the firmness by using other materials. Spring block mattresses may have dependent and independent springs. Dependent springs are intertwined in a specific way. In independent box spring, each spring is in separate fabric box. Mattresses with the independent springs are more comfortable because a large number of the isolated springs (256 springs sq./mt. in most models) might better arrange according to the body form. Springless mattresses create the block of synthetic or natural latex, coconut coir fiber and different high-tech materials. Air mattresses and waterbeds also belong to the springless mattresses. The diversity of mattress filling may mislead because there is a plenty of different materials. Some of them are used since our grandparents’ times, while other appeared not so long ago and an ordinary client knows few about them. It’s a natural material characterized by firmness, hypoallergenicity, and body conforming. In addition, latex is hygienic and provides the perfect spine support. It’s an elastic, firm and hypoallergenic material characterized by high bactericidal properties and used as a filling for firm mattresses. The material is characterized by high elasticity, breathability, and hypoallergenicity. 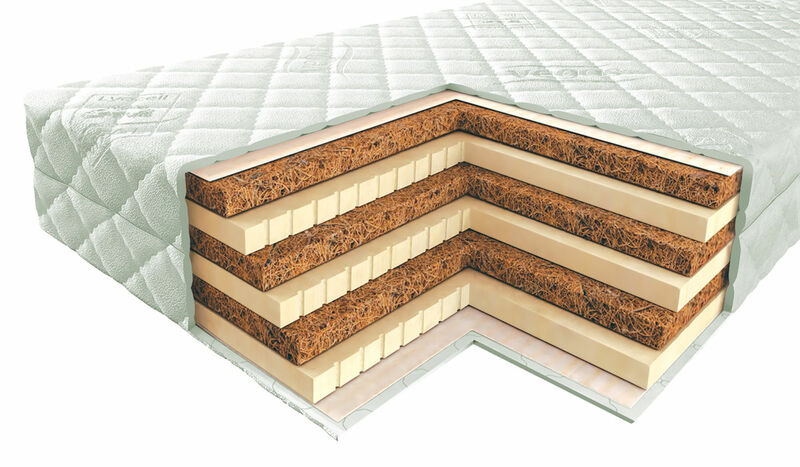 It’s a hypoallergic, firm, safe, durable and high-tech mattress filling based on the flexible polyurethane foam. It creates a viscoelastic foam which contains memory cells looking like little springs compressed under the body weight. It’s a breathable material with a cell structure being immune to the temperature changes. This material is very durable. This innovative hypoallergic material has the “memory effect” and provides as natural as possible the spine position without impeding the free blood circulation during sleeping. It’s a natural fiber with high anti-static characteristics which is capable to blow and transpire the wet flashed while sleeping. It’s a very firm material intended for the intensive load. Most mattresses presented in the shops are 1-sided ones but some companies specialized in the production of the orthopedic mattresses also offer 2-sided models. In 2-sided mattresses, both sides can differ their firmness and cover types. For example, 2-sided mattresses for different seasons have a wool layer and a softer filling on “winter” side to save the warmth, and their “summer” side is covered with the adsorptive cloth and provides good air exchange in the hot season. They are designed in such a way that provides the perfect back support keeping up the health of the locomotion system. It confirms properly to the anatomic contours of the body preventing the numbness in the extremities and another discomfort. People with pain in spine, ligaments, and joints need orthopedic mattresses. For healthy people, the qualitative orthopedic mattress may be the effective prevention of the problems with the spine. This is by no means an exhaustive list of mattresses fillings. Such as natural and synthetic materials as felt, horse-hair, natural wool, Latex with different additives, Struto fiber etc. are used in the production of mattresses. Which mattress is to choose? The main criteria of mattress choice are personal preferences but you should take into account other details such as your weight, age, and health status. It’s better for overweight people to give priority to the firm mattresses while the soft mattresses with independent springs or latex filling are recommended for thin ones. Persons of middle size can sleep with ease on any mattress. It’s important to take into account the age. Doctors don’t recommend to the elderly to sleep on the mattresses of the high-level firmness because it might provoke the problems with the spine and blood circulation. It’s more difficult to choose a mattress for a child. The firm mattresses for example from the synthetic foams are recommended for the children of the junior school age and teenagers. Children’s mattress should be firm because kids will necessarily jump and play on it. The main criteria in choosing of a crib’s mattress are its hygroscope characteristics. The best variant is a little mattress 3-7 cm thick with coconut coir fiber. The best mattress for a couple is a medium firm model with independent pocket box spring. If one of the sleepers often rolls over or awakes during the sleeping another part of the mattress stays fixed. How to choose right mattress firmness? The mattress shouldn’t be too short but it’s more important if it corresponds to the dimensions of the bed foundation and doesn’t hang over the edge. It’s easy to calculate the mattress size. It should be at least 20 cm above your height. The width of a single mattress is 80 cm and more, a double-sized one is 160 cm over. The natural materials are environment-friendly and durable but most of them are harmful to allergy patients. Thus if you suffer from allergy, give priority to synthetic materials. The people who suffer from lumbar diseases are recommended to pay attention to the soft models providing perfect lumbar support. Medium firm mattresses are nice and neat for the people with the problems of the thoracic spine. Firm mattresses are fitter for those who suffer from the pain in upper back and osteochondrosis and also for those people who would like to improve the posture.